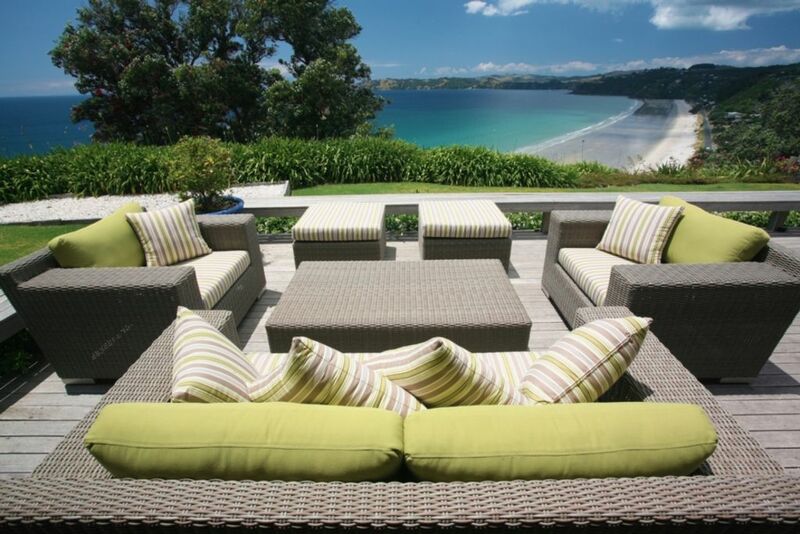 Replenish your soul at Wairua, an exceptional private retreat for the perfect Waiheke holiday! Located on the cliff top above spectacular Onetangi beach, enjoy all day sun from this spacious, north-facing designer home. Wairua has a fully equipped chef's kitchen, beautiful open plan indoor/outdoor living and dining areas, two lounges, two gas fires, all quality linens and immaculate gardens. You will love the breathtaking panoramic sea views from all areas of this luxurious waterfront home. Two bedrooms with king sized beds (can be split into king singles), a full bath and a private lounge area are located on the second level and the third bedroom, with queen sized bed and ensuite bath, is tucked away on the main level. Additional features include, two flat screen TV's with sky and DVD players, stereo with ipod dock, wifi and washer/dryer. A gas BBQ, beach towels, sand toys and boogie boards are also available for guests. A 10-minute walk down the hill leads to Onetangi beach with its 2.5 kilometers of white sand and a further 10-minutes down the beach leads to the local pub. A 5 minute walk leads Miro Vineyard (and 2011 Metro Best Rural Restaurant, Casito Miro) and to Obsidian Vineyard. From February 9 2016 to May 09 2016 - 2 night minimum stay - $950 per night min 2 nights, $850 per night min 3 nights, $750 per night min 6 nights. From May 10 2016 to October 20 2016 - 2 night minimum stay - $750 per night min 2 nights, $650 per night min 3 nights, $600 per night min 6 nights. From October 21 2016 to December 16 2015 - 2 night minimum stay - $800 per night min 2 nights, $750 per night min 3 nights, $700 per night min 6 nights. From December 17 2016 to May 6 2017 - 5 night minimum stay - $950 per night min 5 nights, $850 per night min 6 nights, $750 per night min 13 nights. Linen and exit cleaning are included in the rates. A $1000 cash bond is required or all bookings. A $1000 cash security bond is required for all bookings. The bond is to be deposited into the owners account prior to arrival. Chefs kitchen, indoor/outdoor living areas, gas fireplaces, luxury linens.. all details considered. Had a great stay, lovely location. Greeted with local wine and hand made soaps. Very comfortable, aircon was appreciated although opening windows and putting mosquito deterrents on also worked well. Everything was of a high standard. Only issue we had was upstairs shower was blocked but just used the downstairs instead. Lovely big bath our 2 year old enjoyed and had a fantastic bbq dinner overlooking the wonderful vista. Price seemed on the more expensive side but was worth it for the view and location. Property manager very easy to deal with. Would recommend. Absolutely stunning property and location, views down Onetangi made just sitting around home seem like pure luxury. Entertainers dream, but also fantastic for our kids to run around the lawn. Our two year old couldn't get enough of the outdoor shower! Thanks again or a wonderfully relaxing holiday. ThIs property is just beautiful, not one fault. ThIs property is just beautiful, not one fault. We have stayed in many places in Onetangi over the years, but this has been our best. We loved the spaciousness inside with plenty of room for us to spread out and the outdoor areas with those two stunning views....fabulous! One of the most beautiful properties we have ever stayed in; the view was just breathtaking. One of the most beautiful properties we have ever stayed in; the view was just breathtaking. The house was fantastic for a family with small children - had everything we needed. I was sad to leave! Nice and handy location, an absolutely stunning and relaxed home. Nice and handy location, an absolutely stunning and relaxed home. We loved our stay and will definitely come back! !